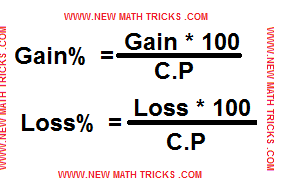 Hey friends, Well come to the 2nd tutorial of shortcut formula of profit and loss. As per our regular habit, we have prepared the math chapter in several sequences and step by step level up gradation. In the last tutorial of profit and loss, we had known the basic concept and basic shortcut formula of profit and loss math chapter. As you know that the competitive examination, becoming more critical day by day, so we should prepare well to tackle that challenge easily. So it is our small effort for you. Please try to observe it for your best score in the competitive examination. Here we will solve some quantitative aptitude of profit and loss chapter by using the shortcut formula of profit and loss, which is known as math tricks to all government and banking job aspirants. All aptitudes on this page solved by using the folwing formula which is already given in the last tutorial. The cost price of a product is 200. A shopkeeper sells the product at 250 rupees. Find the percentage of profit of the seller. A seller makes a profit Rs 2500 by selling an Android mobile at Rs of 7500. Find the gain percentage of the seller. A seller sells a power bank charger at Rs 660. And he took that he loses 60 rupees. Now find his loss percentage? A bookseller sold a book at Rs 500 and took that he loses Rs 100. Now find the Gain percentage of the bookseller. Need more Profit And Loss Shortcut Formulas? Please note in the above, we use rupees as currency. And using ‘Rs’ as the shorter form of ‘rupees’. Here we are not ending this page. Few more links are below. Because we have to solve a few more quantitative aptitude by using math tricks. Just we discussed Loss and Gain percentage. We have to know more formulas like Selling price, Cost price, Profit and Loss, Marked price and many more formulas where various data were given or missing. For that purpose, we are making this tutorial in several parts. We always recommend you learn Shortcut formula for saving time in the competitive examination but not learn shortcut formula in a shortcut because there is no shortcut key to get the success that you learn in a shortcut. So learn all formula by giving time then you can solve Quantitative aptitude in very short time.